Not Even Reached Planning but Ground Surveys Already Started! WE HAVE STARTED FLASHMOB PROTESTS TODAY SUN 15TH JUNE, ON SEFTON PARK MEADOWS. This means regular protests of local people on the Meadows – whenever we have the time and opportunity.Go with your dog, banner, bike, a book, family, or whatever. JUST STAND THERE, DO A SELFIE IF YOU CAN AND SEND IT TO THE MAYOR, LOCAL PRESS AND YOUR COUNCILLOR – AS WELL AS TO FACEBOOK AND OUR CAMPAIGN. WHY? Liverpool City Council has already instructed surveyors to make a topographical survey and start assessing ground and soil conditions for housing development on Sefton Park Meadows – before they have even announced publicly who the developer is, or submitted a planning application! Campaigners watched in horror as two men in high viz jackets from Survey & Design Ltd of Leigh started to mark out positions with a GPS survey pole at 8.30am on Mon 9th June . On Thurs 12th June , ALM Consult from Skelmersdale, came out drilling for survey soil samples on the Meadows. Local resident and Chair of Save Sefton Park Meadows Campaign Ken Aspinall asked Survey & Design if they were hired to survey all of the Meadows and they confirmed they were. They politely refused to divulge who they were working for, claiming ‘client confidentiality’. Thank you for your email of 17th April. Following an initial evaluation of the bids received officers are currently carrying out further due diligence. Until this is completed no formal decision will be taken regarding the selection and announcement of the preferred developer. We are looking to conclude this element of the process by June. Therefore any planning application is unlikely to be submitted by the developer before September. We are now in June, surveyors have been out several times this week – and still Liverpool City Council will not reveal the house builder who will be seeking to build on this historic and highly valued green open space. WHAT ARE THEY WAITING FOR? WHAT ARE THEY AFRAID OF? 1. Why are contractors taking soil samples and carrying out a topographical survey of Sefton Park Meadows before Liverpool City Council have announced who the preferred developer is for Sefton Park Meadows? 2. Who is the preferred developer for Sefton Park Meadows? 3. What is the proposed timescale for publishing a planning application for Sefton Park Meadows? 4. Liverpool City Council announced last week plans to build 1500 new homes across Liverpool but would not identify the sites for these homes until September to allow for consultation with communities before identifying the sites. Why have local people never been consulted over proposals to build housing on Sefton Park Meadows? 5. Why is Liverpool City Council not being open with the people of Liverpool? We expect the developer to be announced as Redrow Housing, given recent publicity over their partnerships with LCC on new housing projects. WHY DON’T YOU COME OUT REDROW AND TELL US IF YOU ARE THE DEVELOPER WANTING TO BUILD ON OUR BEAUTIFUL SEFTON PARK MEADOWS! Read the recent Mayoral Commission Sustainability Stakeholder Event Report May2014, brought together under Mayor Joe Anderson to start an independent review of what is required to support Liverpool to become a sustainable city by 2030. The Commission are examining key areas of work Mayoral Commission Terms of Reference, in order to make recommendations to Joe Anderson. The conference for local stakeholders was hosted by Liverpool John Moores University on 12 May 2014. 85 representatives from 50 different organisations in the city included businesses, schools, universities, city leaders, communities, voluntary sector and others. The aim was to create a broad consensus on the forces that will drive Liverpool to become a sustainable city by 2030. The report above, makes interesting reading on the need for high quality greenspaces! Mayor Joe Anderson stressed the Commission’s independence and encouraged people to think outside the box! The Green Party reported that opposition to the sell off of Sefton Park Meadows was the top local issue on the doorstep in Greenbank Ward during their successful campaign in the May council elections. Winning Green Party candidate Lawrence Brown had tried several times to get elected but in May, won almost 50% of the votes with the Meadows being a deciding factor. Greenbank covers part of Sefton Park, and the 2 Labour Greenbank councillors are not opposing the Mayor’s plans, although they are working on a range of other local green projects in the ward. The Green Party also won a third council seat with Tom Crone in neighbouring St Michael’s ward, which also includes Sefton Park. Tom joins Green Councillors John Coyne and Sarah Jennings in St Michael’s. The Green Party is now the official opposition in Liverpool, ahead of the Lib Dems. 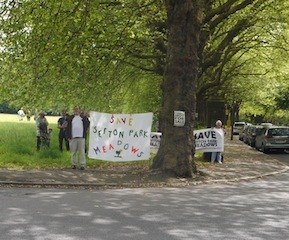 The campaign to Save Sefton Park Meadows is NOT a political group and we have all shades of opinion opposing the sell off, but credit to the Green Party that they started the campaign last year and have made it a major election issue. Campaign members did expect that the Meadows would be a major local issue and told Joe Anderson that Liverpool people love their parks and greenspaces, and Sefton Park is very special. Campaign group member and international photographer John Davies will be taking the Meadows to the summer Liverpool Biennial this year. His new work is a series of photographs of people on Sefton Park Meadows and will be on display at 3 venues from 5th July to 10th August. See Davies PR for details.